On this page we provide communication materials to help create a buzz about World Soil Day. Check this space often because we will keep producing fun campaign materials until December 2018. The official WSD 2018 poster can be downloaded here! Why not adding the World Soil Day banner or button to your blog or your website ? We've provided a variety of sizes for you to download. To download a banner / button, simply right click on the one you would like to use and select 'Save Image As' (PC) or 'Save Link As' (Mac) from the popup menu that appears. Then save the file to your desktop or hard drive. Are you planning a conference or a workshop for WSD 2018? Do you fancy an official pptx presentation template? You can use ours! We have prepared for you downloadable templates in 6 languages and 2 different formats: 16:9 and 4:3! Giving out T-shirts at WSD events can create real team spirit and gives everyone involved a nice souvenir of the day. With these files, you can print your own WSD t-shirts. It’s not hard. We’ve provided the instructions. Everyone can do something great in their own small way! Be the Solution to Soil Pollution invites you to rethink to our consumption patterns, reusing and recycling for a world free of pollution… Yes, small changes in our habits will have very positive effects on pollution prevention and minimization. Download, print and share our postcards with key messages on soil pollution! Discover the reality behind soil pollution and how you can be the solution! Format : JPG (910*6437 px) in EN - ES - FR - IT | PDF available in different languages EN - ES - FR - IT (and printable as 5 separate A4). Would you like to be part of the solution? Read and share our soil pollution cards that explain you how to 'Be the solution' and contribute to #StopSoilPollution! The official WSD logo is available for download and use to help the campaign at your event! Look out for more languages in the coming weeks! If you would like to request the logo in a new language, please send an email to world-soil-day@fao.org. All translations are available on the WSD logo webpage! 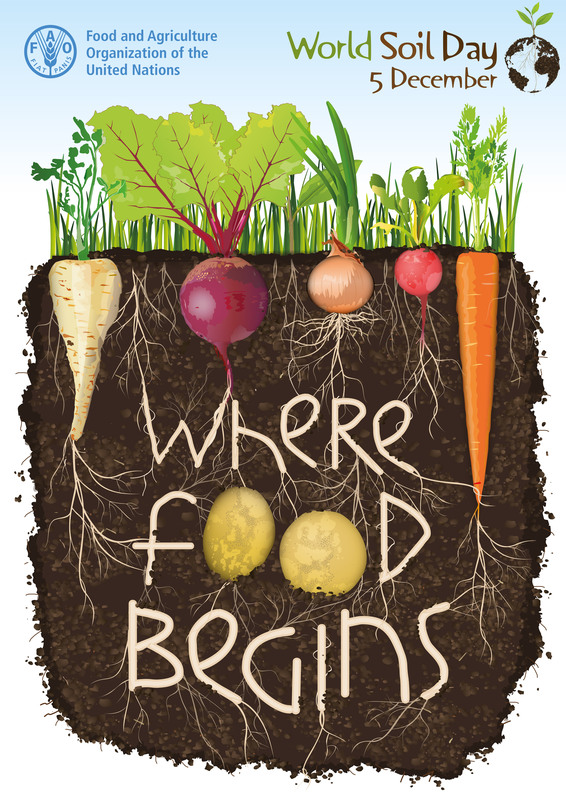 Soil is a complex growing habitat that remains productive only when it is cared for and nurtured. Combating and addressing soil pollution means assessing and minimizing the risks for food security, human health and the environment. An animated illustration of soil organic carbon and its importance for climate action, food production and sustainable development. This short animation introduces the new book “Soils and Pulses: symbiosis for life”. Pulses contribute to soil health, food security and nutrition, and climate change adaptation and mitigation. Soils are a limited natural resource, but their role in food security is crucial. In light of climate change, soil degradation and erosion, farmers struggle to protect soil health. This poster presents in a nutshell the sources, degradation processes and effects of soil pollution on the environment, human health and food safety and security. The symbiotic and strategic alliance between soils and pulses contributes to improve soil health, adapt to and mitigate climate change, and ultimately to enhance food security and nutrition. Soils are under increasing pressure of intensification and competing uses for cropping, forestry, pasture, urbanization. These, combined with unsustainable land uses/management, as well as climate extremes, cause degradation. Healthy soils not only are the foundation for food, fuel, fibre and medical products, but they are also playing a key role in the carbon cycle, storing and filtering water, and improving resilience to floods and droughts. The official posters to celebrate World Soil Day are available for download and print to help the campaign ! Functional soils play a key role in the supply of clean water and resilience to floods and droughts. Healthy soils are crucial for ensuring the continued growth of natural and managed vegetation, providing feed, fibre, fuel, medicinal products and other ecosystem services such as climate regulation and oxygen production. Soils and vegetation have a reciprocal relationship. Soils host a quarter of our planet's biodiversity.Soil is one of nature's most complex ecosystems: it contains a myriad of organisms which interact and contribute to the global cycles that make all life possible. Healthy soils produce healthy crops that in turn nourish people and animals. Indeed, soil quality is directly linked to food quality and quantity. Our soils are in danger because of expanding cities, deforestation, unsustainable land use and management practices, pollution, overgrazing and climate change.